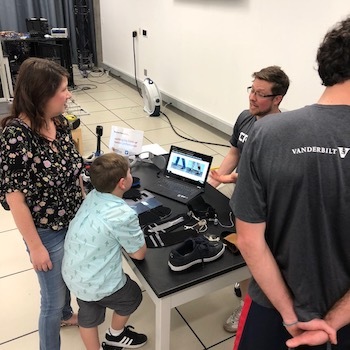 The Vanderbilt group organizing National Biomechanics Day event this year added video scripting and production to its skillset. 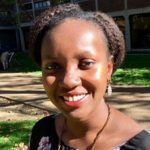 The group of graduate students and undergraduates spent three months planning demonstrations, contacting schools and creating their two-minute promotional video, which won the award from the International Society for Biomechanics for the most retweeted video. The video, “Biomechanics is…,” set the theme for the day. 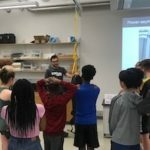 Ten stations were run by 15 graduate students, five undergraduates, a prosthetic user, two representatives from Permobil, a wheelchair company, Karl Zelik, assistant professor of mechanical engineering, and Michael Goldfarb,H. Fort Flowers Professor of Mechanical Engineering. 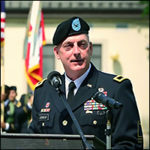 Goldfarb and Zelik co-direct the Center for Rehabilitation Engineering and Assistive Technology (CREATE). A three-hour open house attracted people from across campus and the Nashville community. Earlier in the day, groups from Hillsboro High School, Overton High School, Brentwood Academy and Nashville International Academy participated in tours and demos, as did a homeschool group and a Vanderbilt Day of Discovery. Interest was so high the team added tours for Rosa Parks and West End middle schools the next day. “This is really one of the most fun days of the year for us,” Matijevich said. 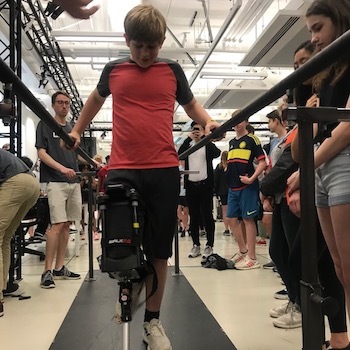 The annual event introduces young students to a dynamic field that includes exoskeletons, sports and prosthetics, exposes undergraduates to potential research areas and forges connections between the School of Engineering and the community. The video award keeps the team’s impressive winning streak intact. Last year the labs had one of three events recognized for “Greatest Impact” among the 150 held across the globe. That award is based on participation, inclusivity and event advertising/coverage. In 2017, Vanderbilt received one of three awards for educational value and creativity. National Biomechanics Day began in 2016 by the and expanded internationally in 2017. Each year the event exposes more than 10,000 K-12 students to this field of STEM, including sites in Australia, Brazil, Chile, the Czech Republic, New Zealand, Portugal, Singapore and the United Kingdom in addition to the U.S.